Disney released a look into its upcoming AVATAR land coming in 2017 to Walt Disney World's Animal Kingdom in Orlando, Fla. The new themed land will be entwined to the trio of sequels continuing the story outlined by director James Cameron. 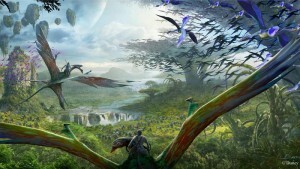 Cameron promises Avatar Land will let visitors "live, eat, breathe and smell Pandora." Guests should expect a world of lush rainforests, exotic creatures and mountains that actually float. Tom Staggs says, "Guests will encounter awe-inspiring floating mountains and wander through a nighttime jungle of bioluminescent plants that are alive with light and sound. Guests will discover what it feels like to soar into the sky riding a Banshee." The land's main marquee attraction will be an E-Ticket banshee flight simulator similar to Soarin' at Epcot and Soarin' Over California at Disney California Adventure. AVATAR's large expansion will be located in the area currently occupied by Camp Minnie-Mickey, and the area will be expanded beyond that original space. For more updates like us on Facebook HERE!